Andrea Charest, owner of Petra Cliffs Rock Climbing Gym and presenter of the Smugg’s Ice Bash, led this clinic. This women’s only clinic was perfect for beginner to intermediate climbers. Learning and finessing the basics of how to climb ice using crampons and ice axes, incorporating balance, movement, footwork, and good axe swings. 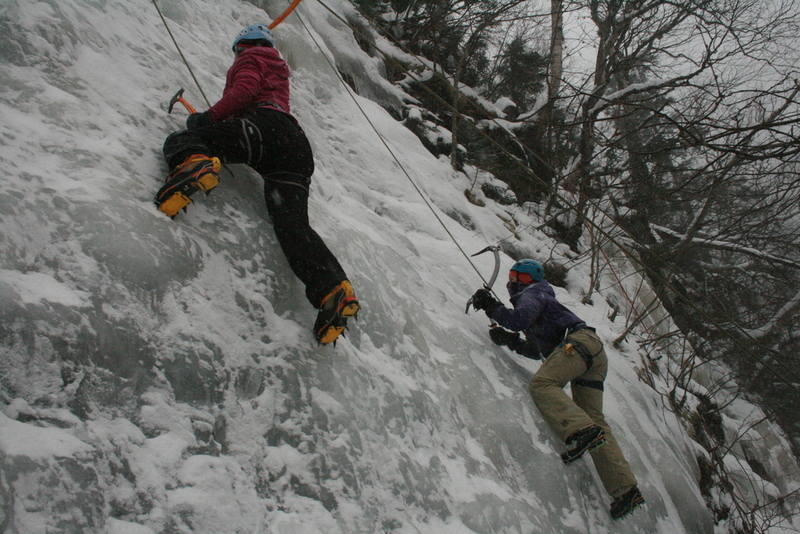 We spent the day climbing varying angles of ice, learning how to rest, stay warm, and tackling any mental barriers. I got to get out for my third time ice climbing where I was able to practice and my swing technique on the ice. The bash had free gear demos, clinics for the beginner to advanced climber, multimedia slideshows, dry tooling competition, raffles and camaraderie in Vermont’s premier ice climbing destination, Smuggler’s Notch. The goal of the Smuggs Ice Bash is to promote the sport of ice climbing, to educate climbers, to exhibit and demo new gear, and to share a weekend of fun, challenge, and inspiration with other winter enthusiasts in one of Vermont’s most amazing places, Smuggler’s Notch. See you next year!